Andreas Weinand’s photo project, “Colossal Youth” struck me. I had never seen or heard of his work before, but I absolutely love it. In this series of images, Weinand documents youth in the simplest, ugliest and most beautiful of ways. This work reminded me of growing up, and the range of emotions any teenager is subject to feeling. Passion, lust, sadness, excitement, love, despair and lethargy are only a few on the wild spectrum of emotion that adolescents’ experience, which were documented perfectly in “Colossal Youth”. To get a better idea of what I’m about to talk about, take a quick look at the series of images here. What was most striking about this series of images is that there is not one style, or one specific thing Weinand focuses on. This makes his work less about proving a point or sharing a judgement and more about an open observation of the different aspects of teenage life. For example, there are a decent amount of images in the series that focus on intoxication and partying. 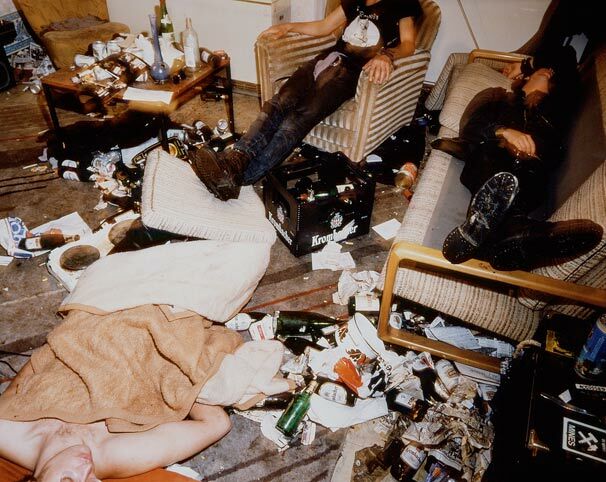 One specific shot portrays a floor littered in beer cans, cigarette butts, empty food wrappers, pizza boxes and liquor bottles and two boys passed out in the midst of the mess. Other shots include social settings where it is clear that substance use is involved, but it is not in the viewers face. There are other shots of kids outside – at the beach, in fields or camping. Weinand documents both romance and lust, and not only the sense of family that these friends possess but the anger and aggressive tendencies that come with alcohol and drug abuse. There is a sense of comfort, innocence, carelessness, curiosity and freedom. In his artist statement, Weinand talks about how he intends to, through photography, reflect on “universal human experiences” by “transforming views and impressions” and “translating an individual impulse on life into images”. This intent is extremely important to know when looking at Weinand’s work. To me, the deepest part of his statement is his aim to reflect on universal human experiences, which I believe he does excellently in “Colossal Youth”. 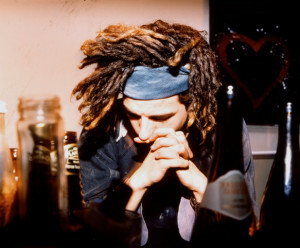 By not solely capturing the partying and intoxication aspect and by incorporating elements of romance, innocence and adventure into the series of images as well as portraying different emotions that many teenagers experience, I believe his work can relate to just about everyone growing up in a similar sociocultural situation. Personally, I feel that the portrayal of emotion is extremely important because it allows universal relatedness, as all humans share the same emotions. I have some thoughts to leave you with, especially because this work relates to the work that I make and I wonder how different audiences perceive it. Do you personally feel like this work can relate to you, even if you have had a different adolescent experience? Do you feel like this work invites you to pass judgement on the individuals being documented, or just observe? I love the photographs and especially appreciate how you ask the two questions in the end of your post. Frankly speaking I personally do not relate to the images and the definition of the photographs about adolescence, however, they are relatable to me in the way I would view people’s adolescence would be, and it allows me to appreciate the vast culture and differences every person experiences. Also it does cause me to jump to conclusions, which shows how quick people can be to judge from a picture and emphasize the strength and influence of a photograph. 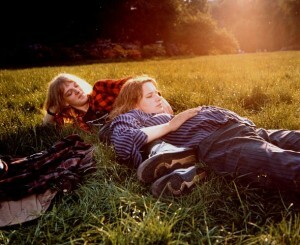 Nonetheless, the images also lets me observe and appreciate adolescence and these photographs. I definitely feel like it’s relateable. Even if no one has ever camped or been to a huge party- it’s something they can think about, or imagine being there. The friendship shown by the two girls, or the infatuation with the couple offers a connection, because most humans want that companionship! I love how he captures the sunlight in the outdoors photos especially.